It certainly has been awhile since I've managed to get in a blog post. 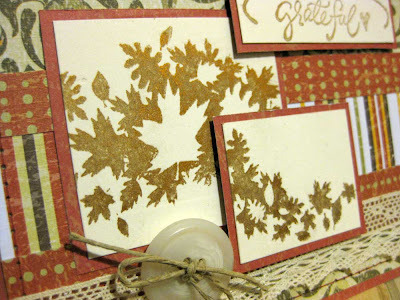 Actually, I haven't had much time for card making these days lately either. We've been having lots of family fun though and have actually started to enjoy our summer. Our camping trip went great, my little guy loved camping so much. I think we will make a nature lover out of him yet. We've also been spending time going blueberry picking and boating on our favorite reservoir. My hubby even snuck in some fishing and my little guy caught his first fish. The highlight of the past week for me, and I'd have to say for the rest of my fam., was the time I spent with my little guy at a Mommy and me swim class. The lessons took place for an hour each day for five days and it was offered to children under the age of three. My little guy took to the water like a fish and had me completely amazed. Not only did he get over his fear of the water quickly, he was also jumping off the diving board into the deep water by the end of the week. I have to say I definitely had one of those parent moments where I was completely amazed by my kid and overwhelmingly proud of him. I hope to have some cards up to share with you very soon. It Certaintly is A Moxi Fab Day! Wow-I just got some great news. 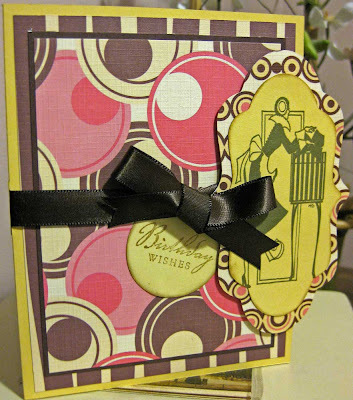 My vintage inspired card was chosen as one of the winners of the most recent Moxi Fab World blog challenge; The Value of Vintage. Although I submitted a few cards, it was this card that I made for my husband for our anniversary that was chosen. I guess that makes it even more special, since I made it for a special guy. Go ahead and check it out when you have a chance and make sure to leave some love for the other winners who's entries are simply amazing. I have to thank Cath for this awesome honor, and I can't wait to receive my prize package of paper goodies. This is turning out to be an awesome day! 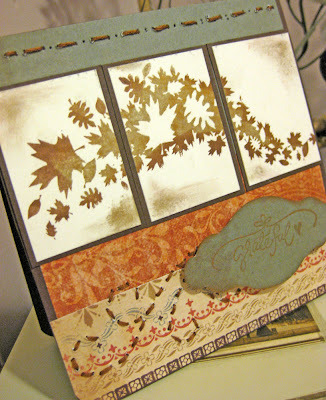 I just love patterned paper--simply adore it. So when I received two new paper packs from gcd Studio's I just had to immediately make some cards from them. Mind you, I managed to sneak these two cards in between entertaining my toddler and packing for a camping trip--thank goodness for nap time! 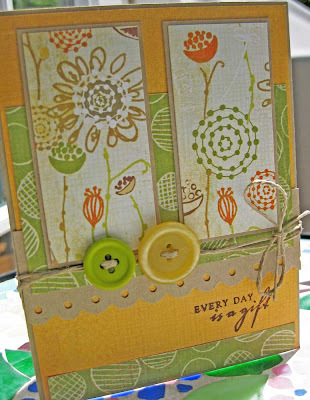 The first card was made with gcd Studio's Eye Candy collection. 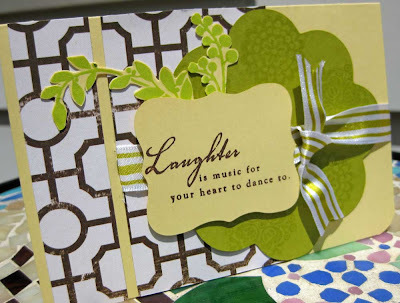 This collection includes bold patterns, clean flowing lines and a choice of eclectic colors. This particular circle pattern reminded me so much of the patterns designers used during the Art Deco period, so I just couldn't resist pairing it with this vintage image I had stored on my C-drive. The great thing about gcd's card stock is that it is a thin grade and can easily pass through a computer printer. I quickly modified the image in Photoshop, cut a piece of card stock down to fit my printer and printed the image directly from my computer. 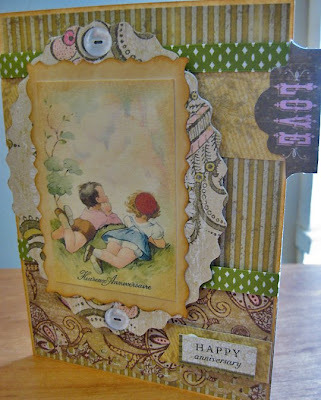 I also based this card on Laura's sketch 28 on the 2S4U blog for this week's challenge. 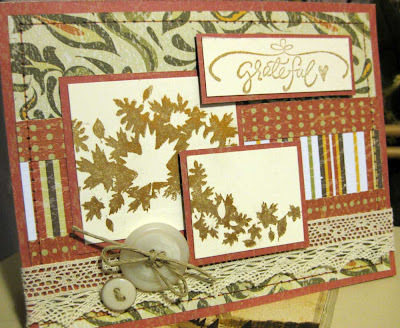 The second card I would like to share was made with gcd's Loverly collection, with it's earthy tones which makes it perfect for Autumn--OK, I know we haven't even gotten through the summer yet, but I couldn't resist making another Thanksgiving card with this beautiful paper. I also used some beautiful delicate lace that I recently purchased from an Etsy shop. I love Etsy so much, especially for finding affordable craft supplies. The great thing about Etsy too is that the shipping costs are usually very reasonable, and that's where you really save. 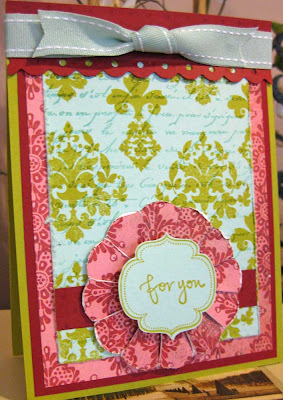 This card was based on sketch 120 on the CPS blog for this week's challenge. I am definitely now a fan of gcd's line of papers and am sure I'll find myself turning to that brand time and again. I also plan to list both of these cards in my Etsy shop Indigo Wings. Thank you for stopping by my little corner of the Internet. I will be computer free, and most likely water logged, for the next three days as we head tonight to the Pocono Mountains for some camping. My little guy is very excited about his first camping trip, it's just too bad it's going to be such a wet one. Well, maybe the sun will decide to pay us a visit after all. A Color Combo So Nice...I Used it Twice! 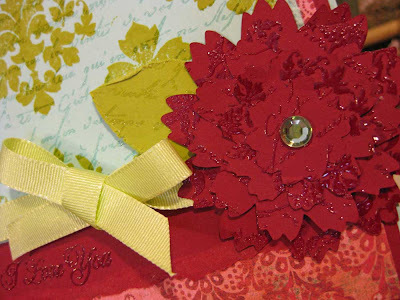 I just had so much fun playing with this color combo and creating my own patterned paper and flower embellishments on the two cards I have to share today. The first card was based on the Card Patterns Blog Sketch # 19. The handmade flower embellishment was a technique I picked up from an on-line tutorial on the Studio Calico Blog. 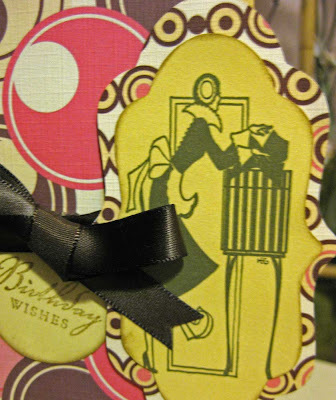 I decided to use the same color combo and hand stamped patterned paper for the next card as well. I created the blue and green patterned paper by first stamping the damask design in kiwi kiss ink onto the aqua card stock, then I set that aside to let it dry. Once it was dry I stamped the French script with Versamark over the damask pattern and then heat embossed it with clear embossing powder. 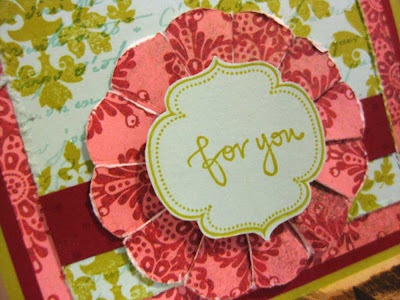 I also heat embossed the patterns onto the die cut flowers, which I made using my Making Memories Slice machine. A quick post before I turn in for the night. It's been raining so much in NJ that it doesn't even feel like we are having a spring. Maybe that is why I have been thinking about the Fall lately, which is usually my second favorite season after Spring, but this year I'm hoping that the Fall will make up for this soggy Spring. 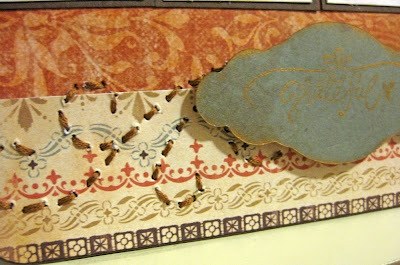 I've also wanted to try some embroidery stiching on my cards. I recently picked up some adorable templates, flourishes and curly cues, that can be punched onto cards with a paper piercer. Once they were pierced I was able to use a needle and embroidery thread to fill it in. I also learned a few things during the process, mainly that you need to use some kind of special embroidery needle--which I didn't have. The needle I did end up using left a few rips around the holes because it was way too big. Another lesson learned. 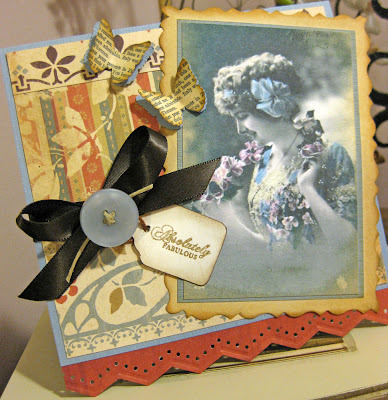 The second card is my submission for the current Moxi Fab World Challenge; Value of Vintage. I just love vintage and incorporating vintage images and embelishments into my cards, so this was one challenge I did not want to pass up. Today is turning out to be a great day--OK, my son didn't take a nap, but I'm still feeling great! I just realized that this is my 50th blog post! That's a mini-milestone for sure. Also, I sold my first card from my Etsy shop--a moment I have been waiting for, sadly, for too long. I sold one of my teacher appreciation cards. I am also very pleased because I finally found time last night to complete my card submission for the 1st Annual 2 Sketches 4 You Ultimate Card Showdown. Is that a great name for a contest or what? I love the idea of a bunch of crafty ladies, scissors in one hand and tape in the other, getting ready for the ultimate showdown. I love the 2S4U blog and Laura and Kazan's card sketches are always amazing! They really put their hearts into it and it shows. I always feel that I get such wonderful and warm encouragement from all the ladies involved with that blog whenever I submit a card for a challenge. That's what keeps me coming back again and again. Some of the supplies I used on this card are my very favorites; Papertrey Ink's Vintage Cream Cardstock and ribbon; The patterned paper is from Basicgrey's Wisteria Collection; The flower stamp is an acrylic stamp by Amy Butler for K & Company; and the sentiment is one of my favorites from Papertrey Ink's "Out on a Limb" sentiment set. 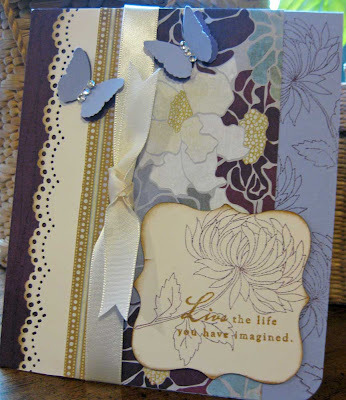 I also used two of my favorite punches from Martha Stewart; Scalloped Lace and the Butterfly. ... or rather dreaming of putting my toes in the sand, although it is not quite beach weather yet here in central NJ. It is a beautiful day, but still a bit chilly, at least for laying out by a pool or sitting on a beach. 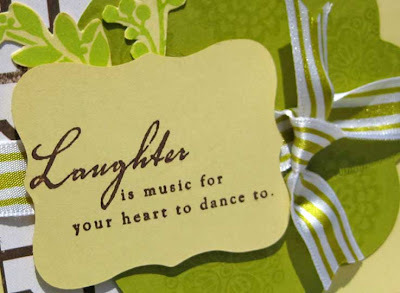 The cards I have to share today definitely help to set off my daydreaming though. 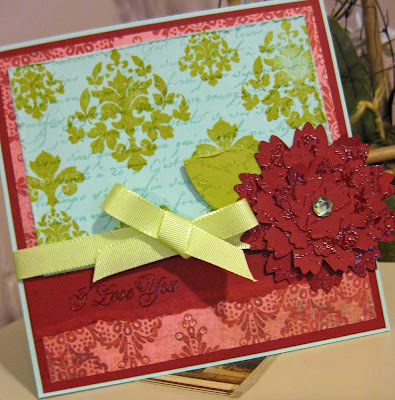 I made both of them for the color challenge on the Moxi Fab World Blog. The challenge was to use citrus colors of yellow and green. You can't get more Summer-ie (ok- THAT'S NOT ACTUALLY A WORD, BUT YOU KNOW WHAT I MEAN) than this. I really had fun with this and it helped to push me out of my comfort zone a bit. I might not have otherwise made a card using this color combo. Also, it worked out great because I had some great papers in my stash that were perfect--I had come by those papers after winning some blog candy a few months back. At the time I thought that they would be perfect to use in the Spring. It doesn't get better than that. This first card was also based on sketch #118 at the Card Positioning System Blog. 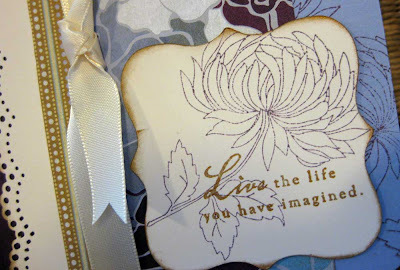 The card stock is from Papertrey Ink, as is the stamped sentiment. 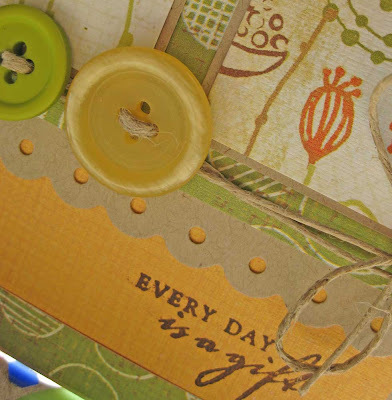 The patterned paper is from Making Memories and the other stamps are Amy Butler's from K & Company. The second card was based on sketch # 17 at the Card Patterns Blog. All of the patterned papers used in this card are from Crate Paper and the sentiment is once again from the Out on a Limb sentiment set from Papertrey. What a great way to start off the week, three challenges down and a lot of fun had putting them together. Now back to work, there is vacuuming and dish washing to get to.